I think it is time to organize a new blog giveaway. Since it is almost the end of summer, I decided to give away a paper and embellishment set that is perfect for those summer memories and albums. This Bo Bunny Mango Luau contains 12x12 papers, cutouts, alpha stickers, stickers, rub-ons and assorted brads. Expiration date is Sunday, August 16th at noon (PST). Woo Hoo! I just became a follower! Nice blog! I have a house on a beach called Turtle Beach...this line is sooooooo perfect for all my photos!! Cool Blog Candy! Thanks.....I added you to my following. Thanks for such a great giveaway! Looks like a fun kit...and I love Bo Bunny! I'd love a chance to win - Bo Bonny products are superfantastic!! I have the perfect photos to compliment this paper line - taken on my beach vacation in Sanibel this year! I have my fingers crossed that I win! And as for your blog, I'll definitely keep coming back! 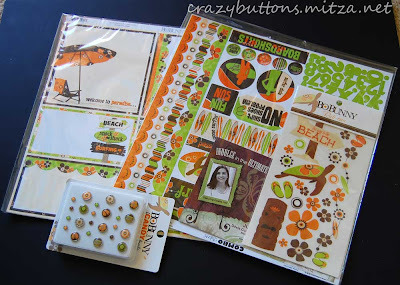 Orange is my favorite summer time color to scrap with - so these scrap goodies look awesome. I am adding your blog to my favorites so I can check it frequently! Just did a super cute layout with a couple of papers from this line. I refrained from buying any of the fun embellies though (darn cost conciousness). really nice paper...Your blog is really nice !!! Awesome give away! Thanks for doing it! Who wouldn't love a Bo Bunny giveaway! Please count me in! Great giveaway!!! Thanks for sharing!!!! Thank you fro the freat giveaway. Hope you have a wonderful day. I became a follower. I love BoBunny. It is and always will be one of my most favorite companies. They make the cutest stuff. The word books are totally rockin'. Thanks for a fantastic give away. I'm in! :following: Cool giveaway! Thanks! I love Bo Bunny! Oh you have my attention! What cool papers and embellies - I'm posting then I'll be following!! Super cool stuff. Will look so nice with summer time pics of the boys! I absolutely adore Bo Bunny! I like the colors on those summer embellies - a little different than the typcial aqua/yellow beachy thing. So cool! Love the colors- so fun to scrap with! Thanks for the chance to win!! Thanks for the chance! (I am already a follower). Bo Bunny is one of my fave lines!! I love this line and have been eyeing it at my LSS. It is so beautiful. You have a cute blog and have made so many beautiful projects. Thanks for the chance to win. Those colors are just awesome, just love this line. Great Blog and thank you for the giveaway. I really really love your blog...And that paper you are giving away is soo sweet... Thanks for the chance to win!! This is the first time I found your blog and I love it. Right away I bookmarked it so I can check back. Thanks for the chance to win your give a way! I love Bo Bunny stuff. I LOVE that BoBunny line and just haven't been able to get my hands on it!! cool giveaway! just became a follower also. What a fun giveaway! I am already a follower! I follow you on my Google Reader. That's such a cute line of papers! Thanks for the chance to win! I'm a follower of your blog now. Thanks for the chance to win. Great giveaway! I am already a follower! This is an amazing line from BB, and perfect for end-of-summer albums. Great blog and I'm now officially a follower.